The Altitude Communications’ Flight Plan to Business Success. It’s time to take your business to new heights, with this unique compilation eBook. 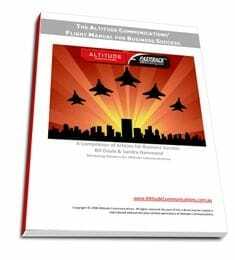 Altitude Communications in association with Business Women Unite are pleased to offer you, a *F.R.E.E* copy of our sought-after eBook "The Altitude Communications Flight Plan to Business Success." If you’re looking for new ways to grow and develop your business – without spending a fortune, then this is it. The Altitude Communications’ Flight Plan for Business Success is your ticket to profit. Compiling the knowledge of Altitude’s Marketing Mentors into a series of informative and easy-to read articles, this eBook will help you to confidently tackle new and emerging marketing opportunities, develop new leads, and most importantly create an environment that encourages your prospects to buy. Register your details below now to receive your *F.R.E.E* copy of the Altitude Communications Flight Plan for Business Success.